Antingham is located in northeast Norfolk, about 2 kilometres northwest of North Walsham and about 6 kilometres southeast of Cromer. In the east the parish boundary follows the River Ant, whilst part of the western boundary follows the edge of Gunton Park. The other boundaries follow roads, field boundaries and other landscape features. Only a few artefacts have been found in Antingham, but this may reflect a lack of investigation, and the picture may change when, for instance, further metal detecting takes place. In the meantime, quite a number of entries on the record are from aerial photographs. Excavation in 2004 revealed a small Bronze Age cremation cemetery, a low density scatter of Iron Age pits and post holes, which contained an important socketed iron axehead, two medieval ditches which appeared to have formed part of an enclosure or field system, and elements of a post medieval field system (NHER 37987). A Bronze Age palstave (NHER 36980) has been found in the north of the parish. To the south of this findspot a ring ditch has been recorded. At least six ring ditches and two double ring ditches have been identified in the south of the parish. All the ring ditches could be the remnants of Bronze Age barrows. A sherd of Iron Age pottery has been found in the southwest of the parish. A site close by has produced five Roman sherds. To date no Early or Middle Saxon material has been discovered, although Late Saxon pottery has been found close to Antingham Hall. 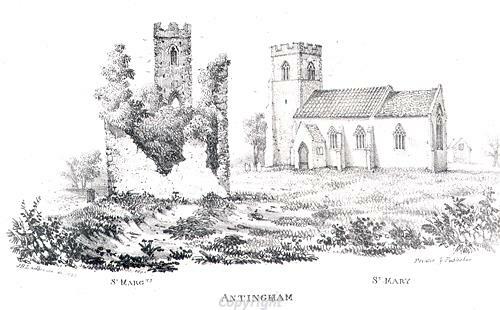 Antingham was called ‘Antigeham’ in the Domesday Book. This is an Old English word meaning ‘homestead of the family or followers of a man called Anta’. In 1086 the Abbey of St Benedict of Holme and Roger Bigot held Antingham. One part of Roger Bigot’s holding was assessed with his estates in Suffield, whilst land in Smallburgh was assessed with a second part. 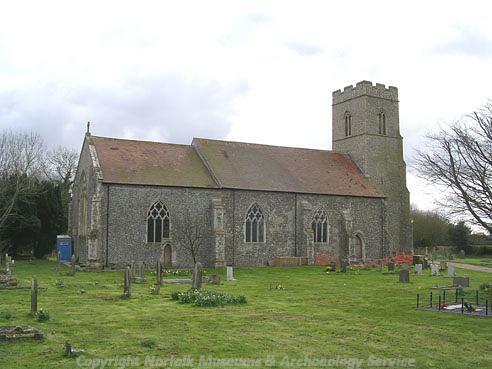 The medieval churches of St Margaret (NHER 6830) and St Mary (NHER 6855) share a churchyard and are located on the western edge of the modern village. St Mary’s was restored in 1864 and has a 12th century limestone coffin slab. St Margaret's is in ruins. Its nave contains possible Late Saxon elements and it was abandoned in the late 17th century. To the southeast of the churches is a medieval moat (NHER 6846) with a platform that resembles a motte. Medieval and post medieval pottery has been collected from sites in Antingham village and from a field in the southwest of the parish. Medieval and post medieval metalwork have been discovered in a field in the north of the parish. A medieval coin has been found in the west. Antingham Hall is a 17th century house that was extensively remodelled in the 18th century. Other post medieval buildings in the parish include farm buildings and houses at White Lodge Barn, Barge Farm, Wilds Farm and Church Farm. Antingham Ponds (NHER 15854) is a water mill that was built in the 18th or 19th century. It was constructed across the River Ant and a lake has formed behind it. Antingham and Southrepps School (NHER 13433) dates to the 19th century and during the 19th century a dovecote stood on top of the platform at the medieval moated site (NHER 6846). 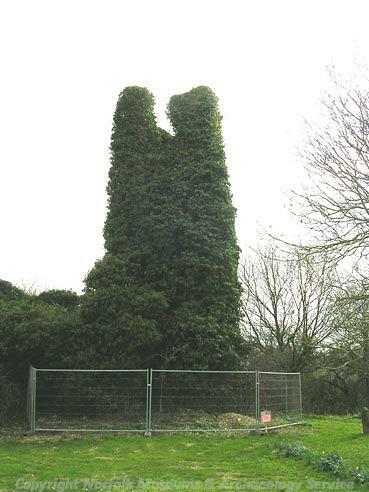 During World War Two there was a searchlight battery (NHER 11622) and a pillbox (NHER 32558) at Antingham Hall. There was at least one searchlight battery (NHER 12142) in the west of the parish, close to the boundary of Gunton Park. It and several possible searchlight batteries have been identified from cropmarks visible on aerial photographs. An American air force plane crashed close to them in 1944 or 1945. Also during the Second World War, the Home Guard constructed earthworks and excavated ditches on top of the mound at the moated site (NHER 6846). In the post war period there was a Royal Observation Corps post just to the west of Antingham Hall (NHER 17732 and 35427). A lookout post and underground rooms survive. A good number of undated cropmarks have been identified in the parish. These include a trackway in the west and enclosures and a field system in the south. A field system, droveway and enclosures have been identified in northwest, as have a trackway and a rectangular enclosure in the northeast. Neville, J., 2004. 'Norfolk Mills'. Available: http://www.norfolkmills.co.uk. Accessed 26th September 2005.